Pepino (Solanum muricatum): growing, planting, caring. Pepino - also called Pepino dulce - comes from the Spanish word for cucumber while ‘dulce’ is the word for sweet. 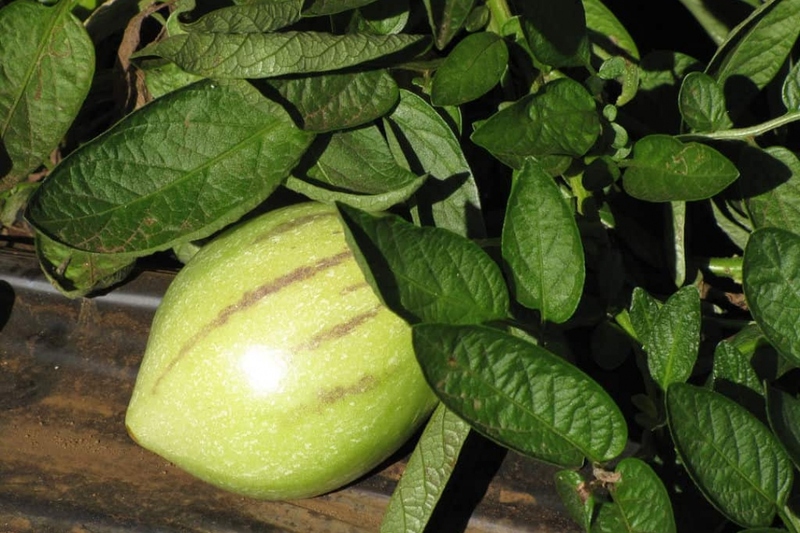 This sweet melon-like fruit is a good source of vitamin C.
Pepino is grown as an annual like tomatoes : it can not be kept outdoors when frost hits. It is a shrub that may reach 1 meter in height, which carries white flowers streaked with violet in early summer. The fruits are clear with purplish strips. As for tomato and most Solanaceae, melon pear seedlings are made during the months of February / March / April depending on your region, in a warm place - 20 ° C minimum - in pots or terrine. Spoon the plants sown in the terrine when they have two real leaves, then keep them warm until the final transplanting, that is to say when the last frosts have passed, beginning in mid-May . If you have purchased seedlings in pots, plant them in open soil after the last frosts. Find a location in full sun in ordinary, well-drained soil. Originating from the Andean plateaus, pepinos like heat, but not drought or heatwave. Plan a plant per m². The planting itself is simple, dig a hole twice as big as the root ball, put back some of the soil extracted from the bottom, and place your plant. Adjust the height of the plant and finish filling. Water copiously. You can also plant in a 50-liter pot filled with light soil and compost. Water without excess, because the pepino neither likes soggy soil nor dry ground. Keep it fresh regularly, especially during fruit formation. Water twice a week in pots, and the first month after planting. To simplify watering, mulch just after planting with 5 cm of mulch or wood crushed in small pieces. put your pepino out after the last frosts! They need the full sun. At the end of the season, remember to put your pepino inside because it does not appreciate the frosts. Store it, and water it from time to time. Harvest the fruits after 5 months of cultivation, from July to October, when the fruits have taken an unbleached hue - and thus lost their green dress. They can be stored in the refrigerator for several weeks as long as they are dry. The pepino fears the cold, so if you planted yours in open soil, make some cuttings. At the end of the season, take cuttings that have formed some wood and carry 3 leaves. Shorten them if they have more. Plant in a container filled with a mixture of earth and sand, then water lightly. You should keep them all winter until next spring, in the light and above 18 ° C.